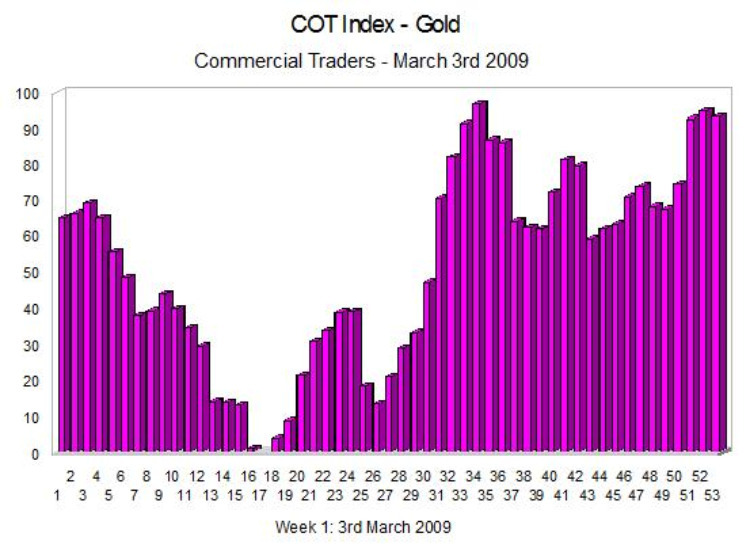 The COT index for gold shows that the rally in the price of gold seems set to continue for some time yet, with last weeks data showing a slight pullback from the rally of the last few weeks, which is reflected in the spot market. The candle chart of two weeks ago provided a bearish engulfing candle with a fall this week, but this increasingly looks like a short term pullback with the moving averages acting as support. The COT index is now confirming this view, and we should see a continuation in the bull rally, with a re-test of the $1000 per ounce in the short to medium term. If you would like to see the latest spot gold price, then these are now available on the live spot gold prices chart, and we have also added an economic calendar, which provides details of all the major fundamental news announcements for the following weeks, backed up with a live news feed.